Open the innovative AddWash™ door to quickly drop in anything extra during the wash* - whether that's a stray sock you missed, extra softener or a hand-washed garment for final rinsing. A muddy teddy, a forgotten sock or a spaghetti spill on a shirt? Don’t waste time waiting for the next wash. Just add them in at any time thanks to the AddWash™ door. * Simple. *AddWash™ door can be opened at any time when the drum temperature is below 50°C. Forgotten to add the softener? Not a problem. 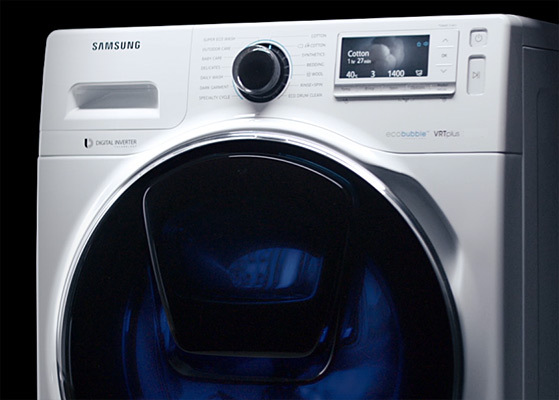 Take control of your washing and add it at any time during the cycle. *Available on Android and IOS. Stay eco-friendly and save on your bills. Our efficient ecobubble™ technology mixes air, water and detergent, creating bubbles that penetrate your clothes faster, helping you wash at cooler temperatures. Welcome to optimum washing performance with ecobubble™. Welcome to a quick, quiet, powerful wash. Welcome to stunning design and performance, available from the palm of your hand. Welcome to bigger loads and less washing.